Redeemable at box office, concession stand or restaurant. Cinemark is not responsible for lost or stolen cards. Not refundable for cash, unless required by state law. Valid at all U.S. Cinemark theatre. 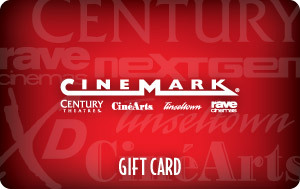 Cinemark brands include Cinemark, Century Theatres, CinéArts, Rave and Tinseltown. Gift Cards not valid in Canada. Orders received after 3:00 pm CST will be shipped the following business day. No Children Under Age 6 Will Be Admitted To Any R-Rated Feature After 6:00 PM. Valid IDs will be required to attend Rated "R" movies. You must be at least 17 years of age or have your parent accompany you to view the movie. IDs will be checked at the theatre.